Harvey Steiman of Wine Spectator did a write up about the unique marketing approach of a new Oregon winery, Alit. With the pedigree of Evening Land Vineyard’s co-founder, Mark Tarlov, and winemaker Alban Debeaulieu, formerly of White Rose Estate, Domaine Drouhin Oregon and Maison Joseph Drouhin, this new project was already guaranteed intrigue but, as Steiman notes, Alit upped the ante by releasing their Pinots for the absurdly low price of $27.45 a bottle. Yeah, you read that right. $27.45 for a premium Oregon Pinot noir from one of the Evening Land guys and a former Drouhin winemaker?!?! Toto, I don’t think we’re in Kansas anymore. The idea behind Alit Wines is transparency with the winery’s website (and Wine Spectator article) going into great detail to describe how they break down the cost figures that brings them to charge $27.45 for a bottle of Pinot noir sourced from acclaimed vineyards in the Dundee Hills, McMinnville (including Momtazi Vineyard) and Eola-Amity Hills. The hope for Tarlov and Co. is that they’ll be rewarded for their transparency with consumers, empowered with the knowledge of the nuts and bolts cost of production, seeing the advantage of bypassing “the middlemen” and buying directly from the winery. On the surface this sounds like a solid strategy and I was intrigued enough to put in an order myself. Potentially great wine at a great price is always a plus and its exciting to think about what could happen if more premium wineries followed suited with this focus on transparency. But as both a consumer and as someone who has spent over a decade in the wine industry (both production and retail), I don’t see this as a yellow brick road leading to a revolution in wine pricing. I also can’t escape the nagging feeling that instead of just empowering consumers, that this peek behind the curtain of production costs will have the same effect on consumers that Dorothy’s glimpse behind the curtain at the Wizard had on her. Yes, it is nice to see what’s behind the curtain but do you lose a bit of “magic” when everything doesn’t seem to be what you once thought it was? Are you going to enjoy as much that $60 Pinot you enjoyed before now that you can add up in the back of your mind that it may really only cost the winery around $15 to make? Pay No Attention To The Conspicuous Consumption of Wine. Wine is weird. On one hand, it is a consumable agricultural good just like any foodstuff. So drilling the price of a bottle of wine down to the price of the raw materials, labor and cost of production and transport sounds like a simple endeavor. Yet, wine is also much more than that and, especially in the United States, it can also be considered a Veblen good–an item whose price and value often drives demand, instead of just necessarily the demand driving the price. This is a big reason why I doubt that you’ll see Alit’s marketing model being readily adopted by other wineries. Of course, nearly every winery in the world would wholeheartedly support encouraging consumers to buy most, if not all, their wines direct from the winery. Not only does it allow them to control the consumer’s experience, making sure that they are getting their wines in the best condition possible, it’s also how wineries make the most money. That last point is key. Look at the prices that you see at a winery’s tasting room and then compare them to what you would be paying at a typical retailer. Are you getting the savings of “cutting the middleman”? In the Wine Spectator article, Alit’s Tarlov explains that this is because wineries don’t want to hurt their distributor and retail partners by drastically undercutting them in price. There is certainly truth to this because the wheels of the wine industry are greased by trust and relationships. However, the one thing more valuable than relationships in the wine industry is the perception of your brand. This is why retailers sometimes get in trouble if they price a winery’s wine “too low”. It impacts the “brand”. Wineries are loathed to ever lower the prices of their wine because it can lower the prestige and value of the wine in the eyes of consumers. A heart is not judged by how much you love; but a wine is judged by how much it is loved by others. Consumers are weird. We all want a great deal, but not too good or there must be something wrong. The placebo effect is alive and well as our brains are hardwired to get more pleasure from things that we perceive as being more expensive and ergo more valuable. Now as wine lovers, who presumably want to get the most for our money, what should we do? Do we just chuck it all out the window and drink Two Buck Chuck from here on out? Let me ask a different question. If you’re a fan of American football, what is more appealing to you? Spending around $50 or less for a family of four to see a local high school football game or spending an average of around $131.93 per person to see a team like the Cincinnati Bengals play home games against the Cleveland Browns and Buffalo Bills? No offense to the Bengals, Browns or Bills fans among my readers but there are certainly games where you can argue that maybe the high schoolers would field a better product for the money. Now we can argue about the nuts and bolts of the talent and skills of football players, the quality of equipment, the stadium atmosphere and then craft metaphors about how that relates to vineyard terroir, winemakers, new oak barrels and such. But I think we can drill it down to a much more simple question: What experience gives you more pleasure? What experience fills you with more sense of excitement and anticipation as you enter the stadium before the game? If you were given a gift of tickets, opening which set (to the HS game or the NFL one) would quicken your heart more? For most people, it’s the latter and that is a huge reason why seeing an NFL game is often 12x more expensive than seeing a high school football game–regardless of the end quality result on the field. The value of the product is judged by how much it is loved by others. With the typical NFL stadium holding around 70,000 spectators, there are quite a bit of people who are willing to pay top dollar to be one of the few who get to sit in those seats. The same is true with a bottle of wine. For as solid and tasty that something like a $8-12 bottle of Columbia Crest Grand Estates Cabernet Sauvignon can be, the level of excitement and anticipation of opening it up just can’t match up to opening something like a $60-68 bottle of DeLille Four Flags Cabernet Sauvignon. There is the bare nuts and bolts value of the raw materials and cost of production but how do you quantify the value in that sense of excitement, anticipation and pleasure that comes from that? With only around 1,450 cases made each year of DeLille’s Four Flags, there are plenty of people who put high value on being one of the few who get to enjoy that sense of excitement and anticipation. You, my friend, are a victim of disorganized thinking (as we all are). Plus there is always great beer under $20! 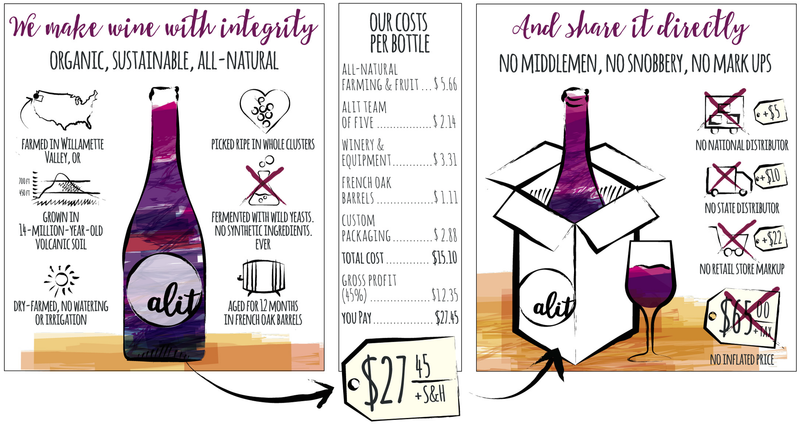 While I do applaud Mark Tarlov and the folks behind Alit for being bold with their marketing plan on transparency, I do think it creates an unfortunate impression that wine pricing is a simple affair. It’s not because wine isn’t simple and, more importantly, people aren’t simple. Just as in Oz, when the Wizard chastised the Cowardly lion for confusing courage with wisdom, we also shouldn’t confuse the value of our pleasure and enjoyment of wine with the nuts and bolts cost of things. Just as our perception of taste is personal, so too is our perception of value. A wine is good is if it is good for you and a wine is worth its price if it is worth it to you. If an $8 Cabernet gives you pleasure and is worth $8 to you, Enjoy! If a $28 Pinot does the same, drink up! But, likewise, don’t devalue your pleasure and sense of the wine’s worth if your mouth drools with anticipation at pulling the cork out of a $60 bottle of Cabernet Sauvignon or Pinot noir. It’s your palate, your wallet and your pleasure. And if paying around $131 to watch Mike Nugent miss fields goals and extra points gives you pleasure, well you can talk to my friend Kyra about that. Tagged Alit, Columbia Crest, DeLille, Harvey Steiman, NFL, Pinot noir, Wine Pricing, Wine Spectator, Wizard of Oz.